Gosh, this post is going to sound awfully selfish of me but I can't help it. Or maybe it's not entirely selfish since I am trying to make it easier for those of you who are trying to figure out what to get me for Christmas. 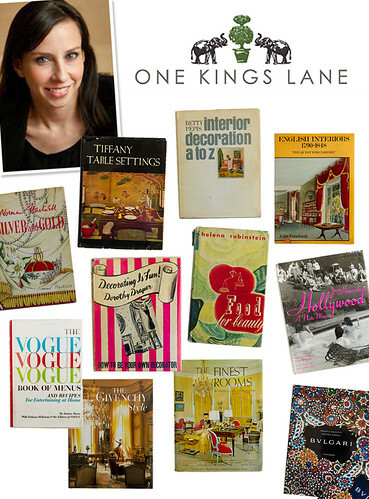 Jennifer Boles of The Peak of Chic will be having a Tastemaker Tag Sale on One Kings Lane tonight at 9pm EDT featuring 50 vintage design & style books and I would so love it if I were to get one of those books for Christmas this year. Totally batting my eyelashes whilst saying this. For those of you who aren't familiar with One Kings Lane, I am sorry that I am just mentioning this now because it is a fabulous place to get some of the world's best designer decor. To further explain, it's an online shop that features incredible sales on top brands for the home that launch every day. But the one caveat is that these sales only last for 72 hours so you have to move fast if you see something you like. Hence, this one-off post on Jennifer Boles' vintage books. I will be doing a proper post on my holiday wish list like I did last year, but I just had to do a one-off for this since these books are pretty rare and well, when they're as rare and fun as these, you just gotta hop on it right quick. Besides, I'm sure you'll have fun shopping on One Kings Lane's website for all of your home decor needs (and wants). I can't wait until 9:00!! Lots of Christmas shopping will get done...thanks for sharing!